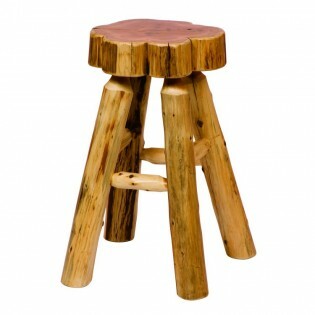 Slab Cedar Log Barstool. This Slab Barstool will make the perfect addition to any of our log pub tables or use them at your in home bar. Each rustic bar stool is individually hand crafted and made of hand peeled white cedar logs to give it a rugged natural look. Slab Cedar Log Barstool. This Slab Barstool will make the perfect addition to any of our log pub tables or use them at your in home bar. Each rustic bar stool is individually hand crafted and made of hand peeled white cedar logs to give it a rugged natural look. It is clear coated with a catalyzed lacquer finish for extra durability. Choose either bar height or counter height to suit your rustic seating needs.